Tour two landmark abodes (and go inside one). 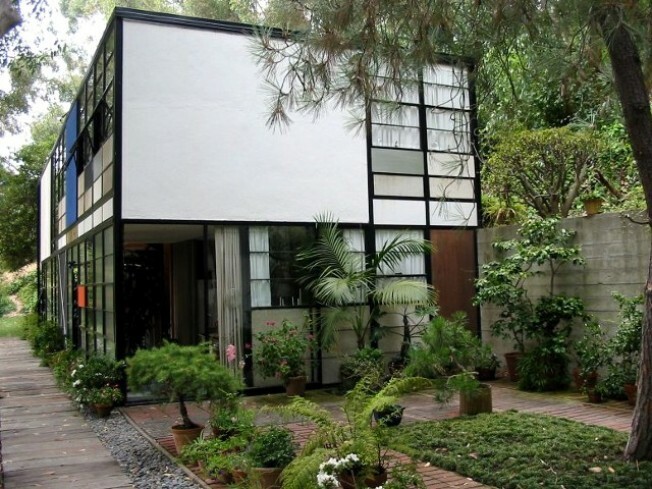 Tour the exterior of the Eames House on Saturday, July 24. Saying "The Eames and the Stahl" almost sounds you're saying like the title of a children's fairy story, perhaps one where the Eames and the Stahl are two mythical creatures with magical gifts. Well. Almost. The Eames House and the Stahl House are two of the most famous living spaces in our city, and, truly, the world; so famous that "House" gets capitalized when it follows the names. Now that is famous. And magical. Andrew Edelstein, an Eamesian docent and Stahl expert, is leading a day out to both future-forward abodes on Saturday, July 24. The stop by the Eames House, which is located in Pacific Palisades, will be an exterior tour; the visit to the Stahl, which is in the hills, includes a look inside as well as out. We'll add that Mr. Edelstein is quoted as being "the only person to give tours at The Stahl House (that is not a member of the Stahl family)." The cost is $115, the time is 2:30 p.m., there will be bevs to keep it cool, there will be some sort of carriage to convey you between the two case study houses. The history of the Eames, by the way, says that Charles and Ray Eames took residence at the house on December 24, 1949. There's something so romantic about that date and that year and that it all sat on the precipice of the 1950s, a decade that would change home design and design design forever. And that the Eames would be at the forefront. We can't stare at the picture of the beautiful Eames House any longer or we'll fall right down the romantic rabbit hole, like in a children's story.